Published: Feb. 2, 2013 at 07:16 p.m. Updated: Feb. 2, 2013 at 11:59 p.m.
NEW ORLEANS -- Choosing your favorite rookie quarterback in 2012 is like choosing your favorite flavor of ice cream. You really couldn't go wrong, but The Associated Press voters for NFL Offensive Rookie of the Year ultimately got the choice right. 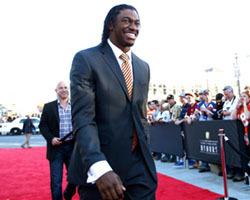 Robert Griffin III of the Washington Redskins won the award Saturday night at "NFL Honors" over the Seattle Seahawks' Russell Wilson and the Indianapolis Colts' Andrew Luck in one of the best rookie crops of players in NFL history. Running backs like Washington's Alfred Morris and the Tampa Bay Buccaneers' Doug Martin would have been in the mix to win most years. "Well, it's a truly a blessing to be up here and be able to stand, first and foremost," Griffin said when accepting the award as he continues to recover from knee surgery. "It seems like league's in good hands with the young quarterbacks." The NFLâ€™s brightest stars come together for the second annual NFL Honors award show. Take a look some of the best photos of the night. Griffin was the best option because he was excellent from the very first week. Wilson ultimately wasn't a huge factor in the Seahawks' offense for the first five to six weeks of the season. RG3 also was steadier than Luck, who had a dip in play during the final stretch of the season. I made my case for Griffin back in December. Wilson's playoff excellence didn't factor into the award, or he might have won. RG3 combined insane athleticism with smarts beyond his years. Like Wilson, he was such a good decision-maker. Griffin was accurate and explosive, and he avoided mistakes. He played like a veteran. Luck took more chances, showed an amazing ability to avoid pressure, and his highs arguably were higher than any other rookie. Luck was asked to do more than anyone, but ultimately he was not as consistent. It feels silly to knock any of the rookie quarterbacks because all three would have been great choices for the award. But Griffin ultimately deserved this round in their competition. It was an incredible season from this trio. I can't wait to see Round 2 next season.